I figured this would be a good point to visit all aspects of the Caps’ recent performance. 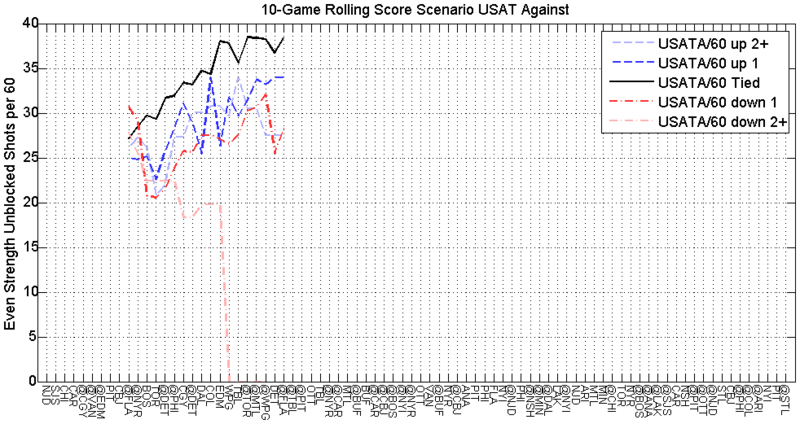 There’s been a few uninspiring games lately, and last night’s game was just about the worst I’ve seen this season. 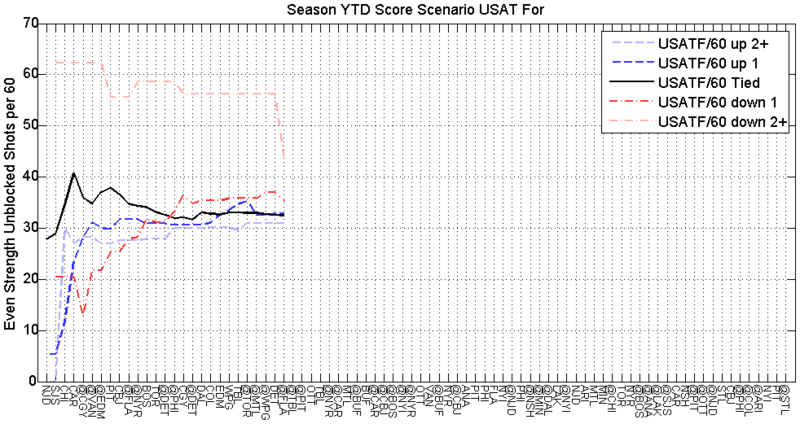 Therefore, I’m sure most of the Caps’ fan base is in some form of panic after our expectations have been rightfully raised given the torrid start this team has pieced together. Well, I don’t necessarily have good news. 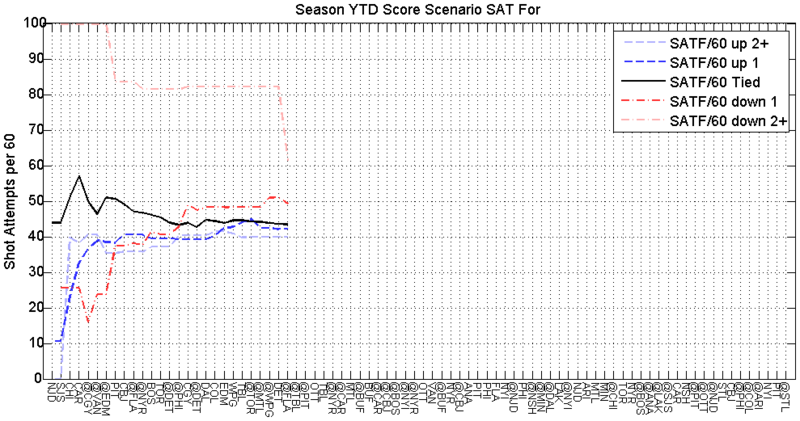 Things do look a little bleak. 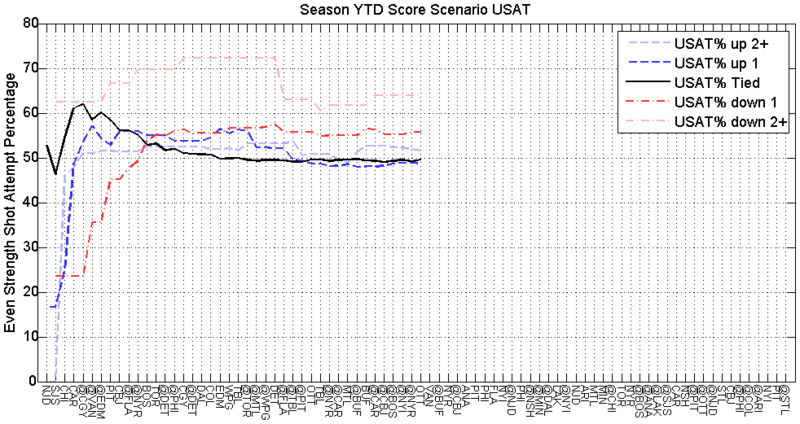 I’m not particularly pessimistic because of the trends, but because of the trends given the opponents. 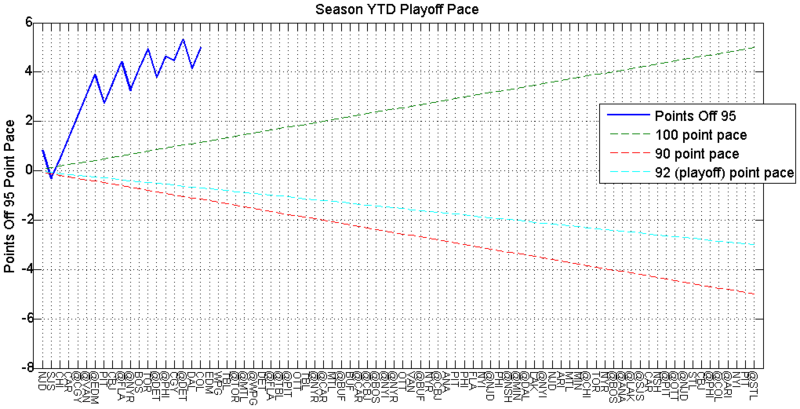 I’d actually be happier to see bad patterns with teams unlikely to make the playoffs. 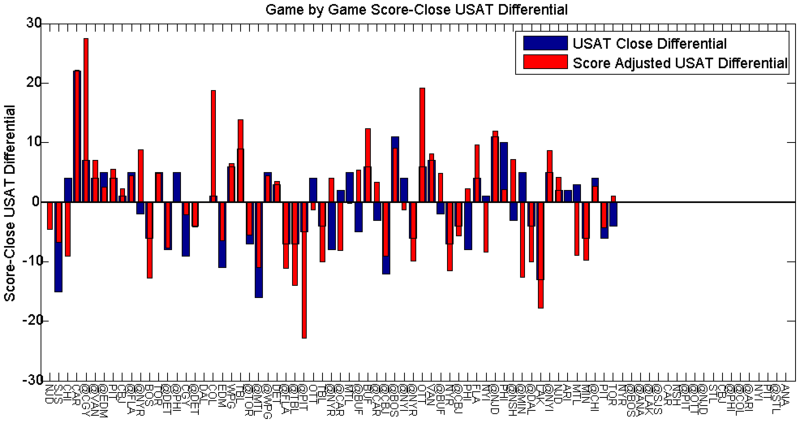 When the patterns coincide with the opposition being some of the better teams in the league, then it makes you wonder if the Caps really are as good as their record indicates. 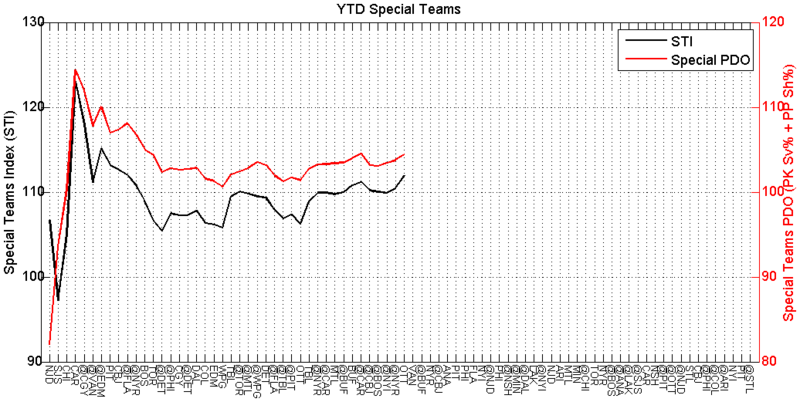 Were they just beating up on weaker competition in the beginning of the season? 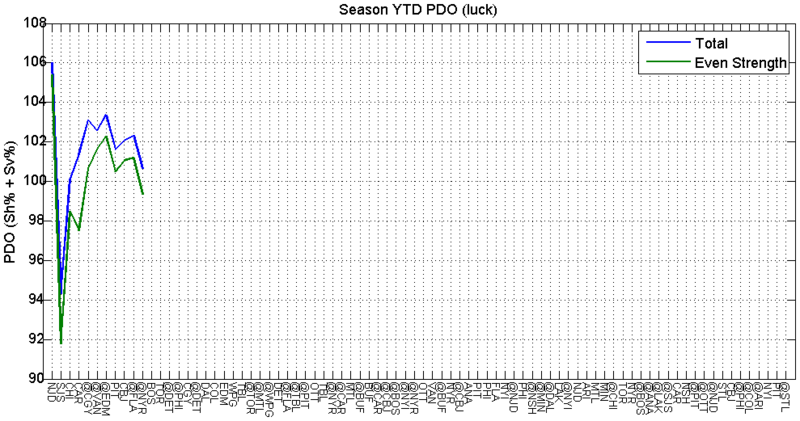 I know that sounds a little backwards, but I’d be more willing to assume it’s a fluke if the Caps were turning in bad performances because of mental blunders or lack of preparation. 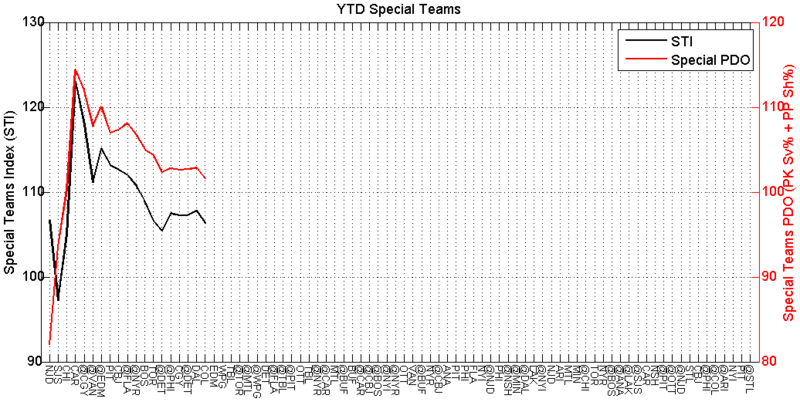 But when it’s becoming a consistent pattern that the Caps can’t compete as well with the better teams in the league, well then it doesn’t make April and May sound too fun. This obviously isn’t a cause for concern. 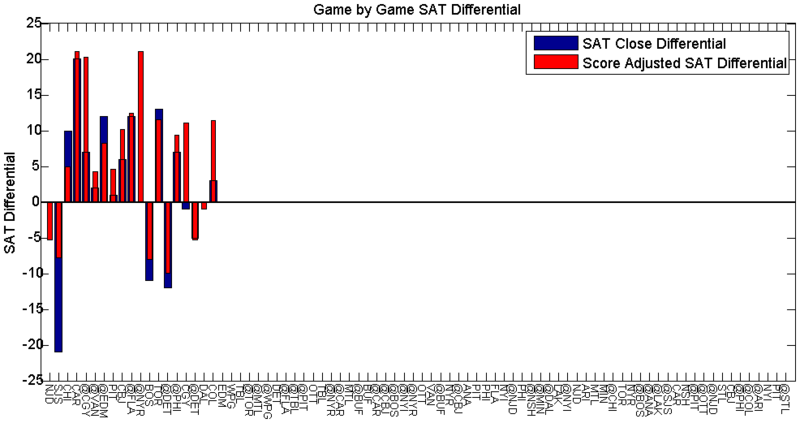 The Caps have given themselves room for error, by picking up points consistently, and by not dropping more than 2 games in a row…yet. 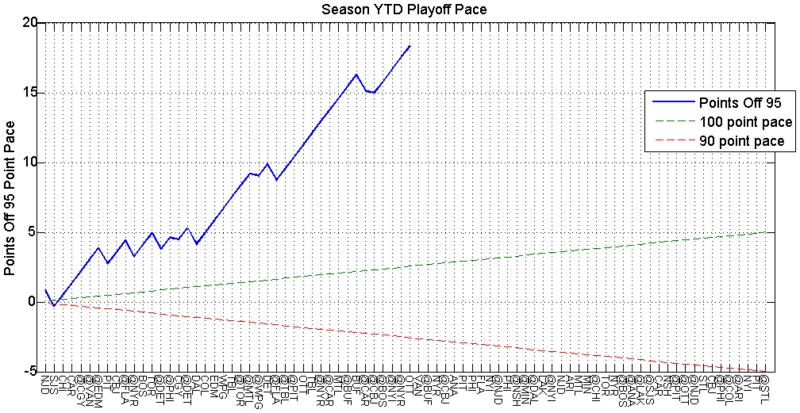 Every little drop in the pace, is followed by an immediate uptick. That is encouraging. 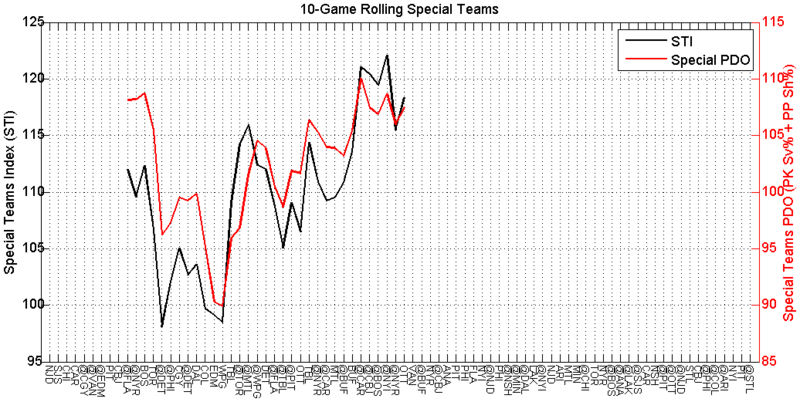 At least it can imply some level of resiliency in this team. 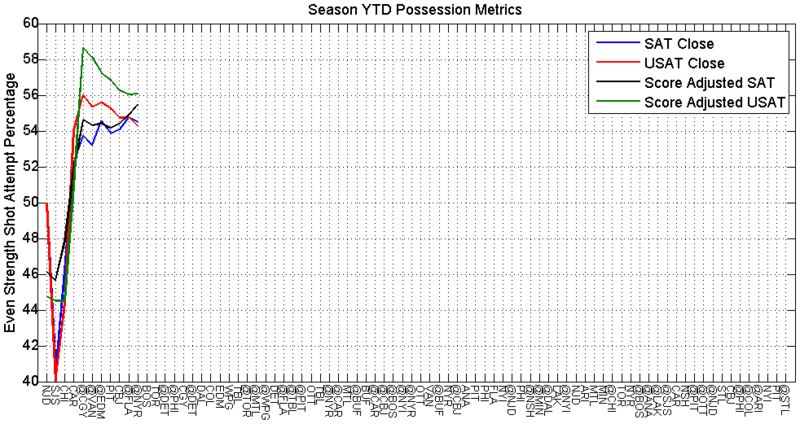 Either way, over the past 10 games, the only way this team is above 50% possession, is if you adjust for score and look at unblocked shot attempts (Fenwick). I’d prefer to not have to qualify their recent performance to find a good result. 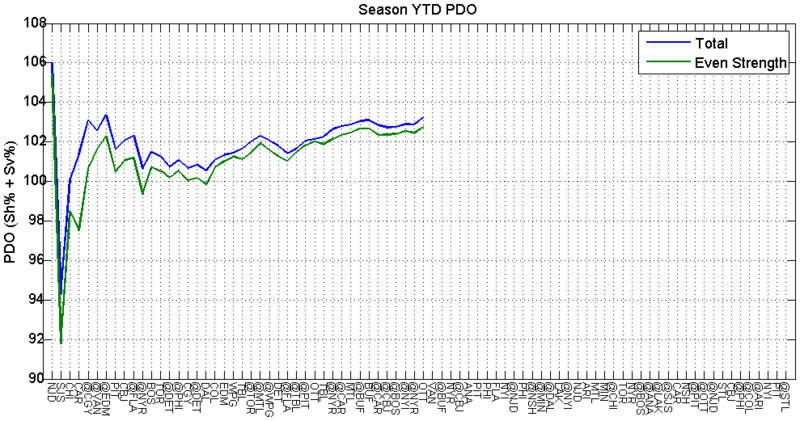 This is one of the more troubling trends. 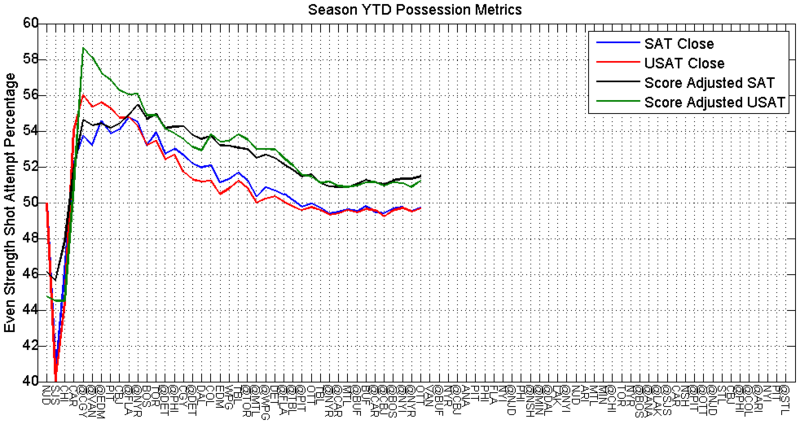 The Caps were heralded earlier in the season for their defense. 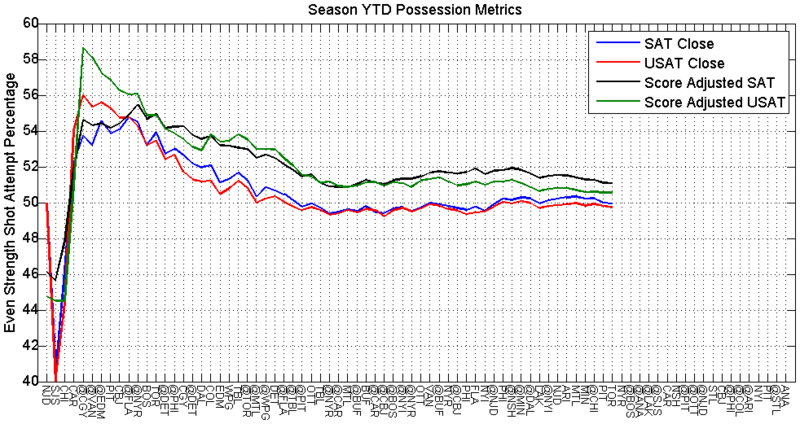 They were one of the top teams in limiting shots against. This, however, has not continued. 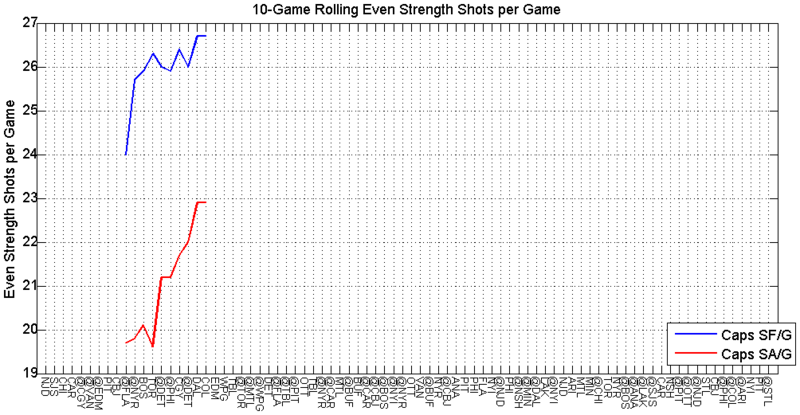 Things may look a bit better at all situations, but at even strength – Caps fans should maybe be a bit worried. 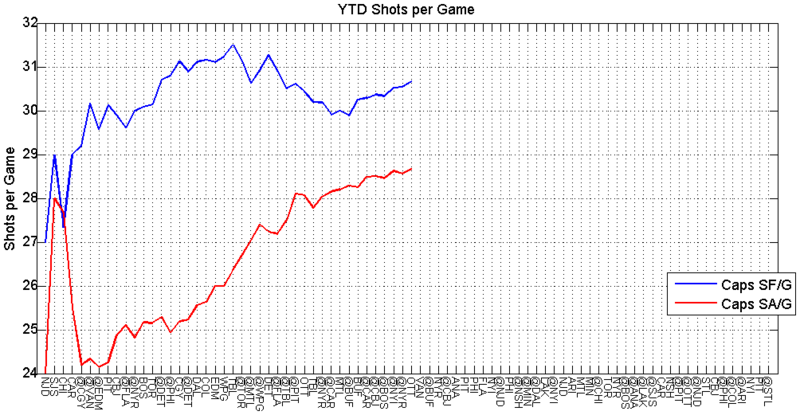 However you want to filter what you’re looking at, the Caps are letting more shots happen in their own end. 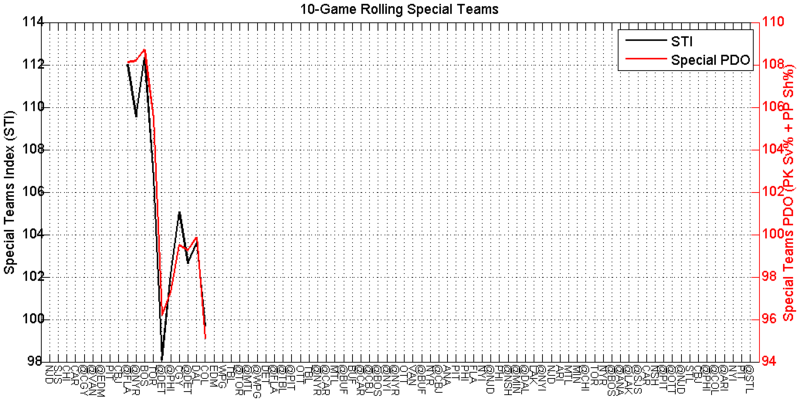 And the 10-game rolling data is going in all the wrong directions at even strength. 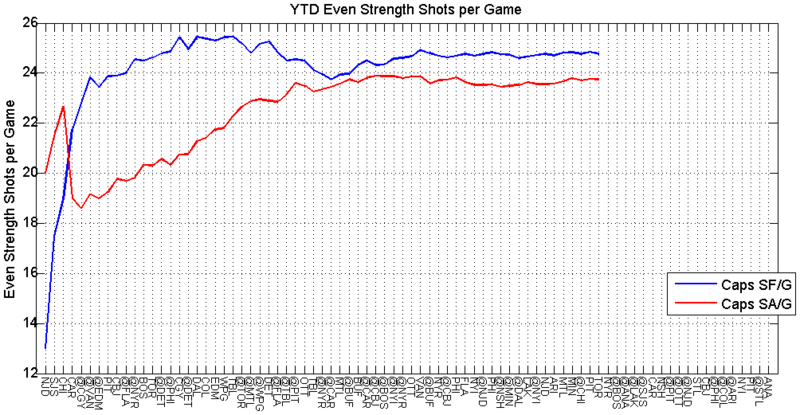 Shots for are coming down, shots against are going up (and fast). The Caps are still getting bounces. 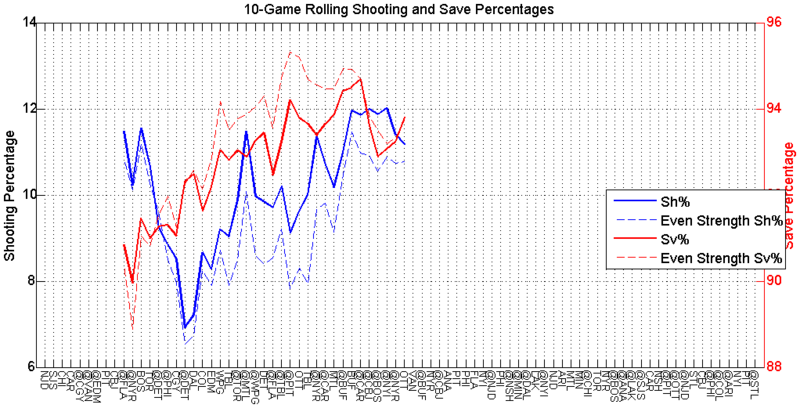 Maybe not last night, but overall they still are getting good conversion on goals, and elite goaltending. The performance last night may not be elite, but we know Grubi isn’t this team’s #1 netminder. And I don’t particularly fault him for any of the goals he let in. He was solid when he needed to be. A deflection, a laser, and a beautifully played 2-on-1, aren’t shots every goaltender will stop with ease. 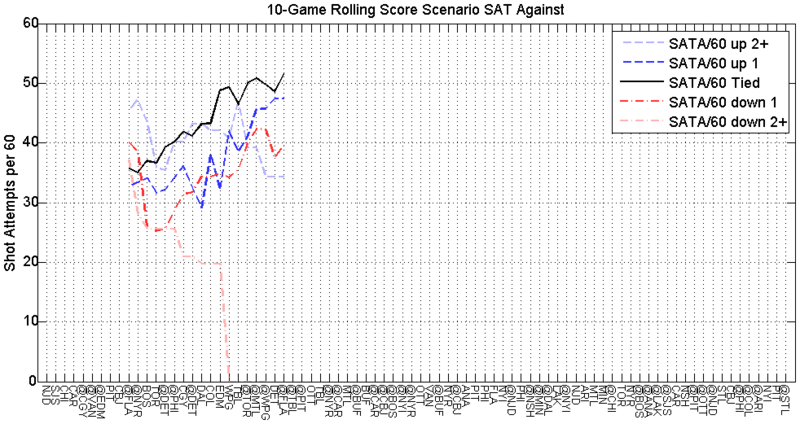 The Caps could still find themselves with an streak of bad luck somewhere in the season, and if it coincides with play that is similar to the stretch we’ve seen recently, then there is cause for concern. This is the one area where things look good. 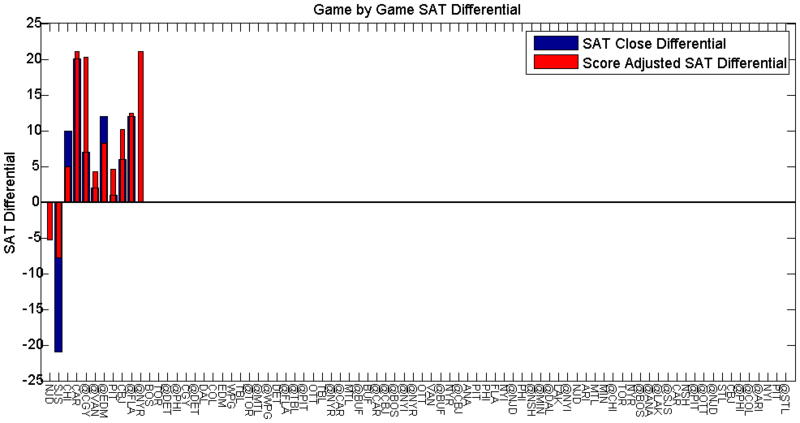 Before last night, the Caps had the best STI, and I believe they had the highest Bowman index (sum of their rank in PP and PK) in the league at 9 (3 PP + 6 PK). Actually, after a quick check they’re still near the best in the league with an STI of 107.9 (2nd best to Boston’s 108.5), and a Bowman index of 10 (3 PP + 7 PK), which is still best. 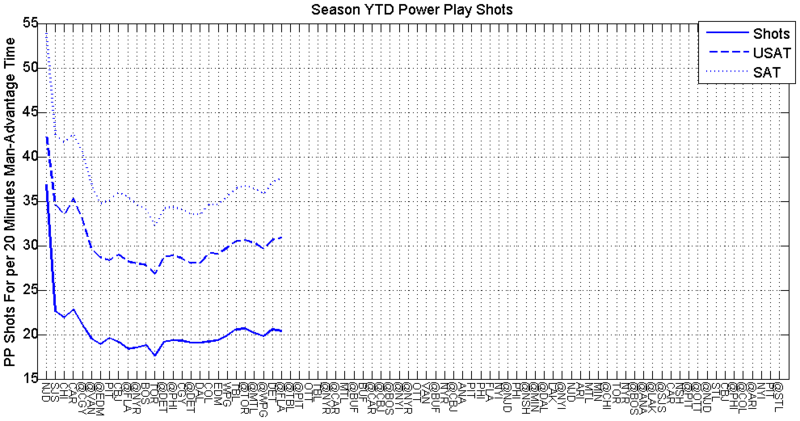 I may be selling the Bruins short, but I doubt they’ll continue to convert on 29.9% of power plays. These are all encouraging. 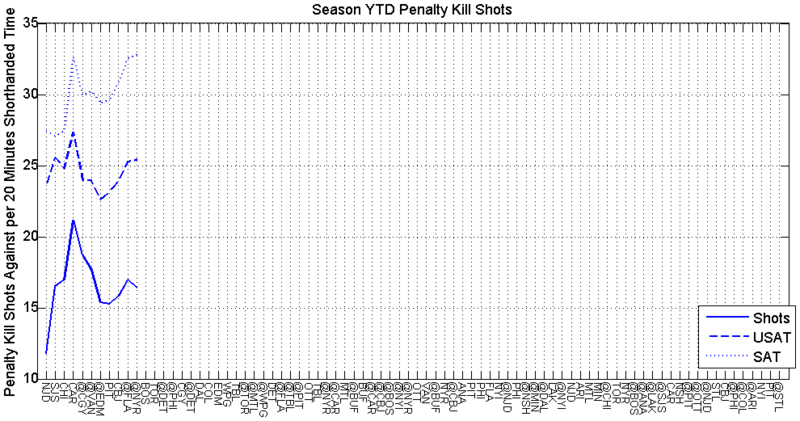 Ovi has finally started to get a few PP goals, and the Caps are slinging a lot of rubber at the opponent’s net when up a skater. 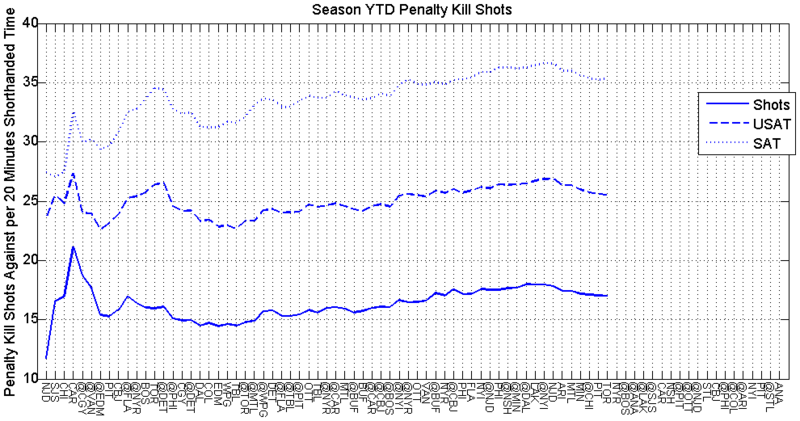 The Caps still draw a lot of penalties, and they are getting more than 1 SOG per minute of PP time. 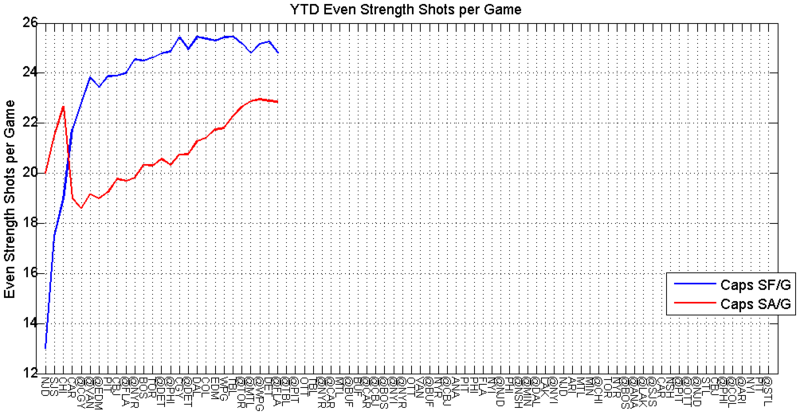 Their shooting percentage is lower than we’ve seen in previous years, and we’re not seeing as much movement as I personally expected (after the coaching staff mentioned it as an additional wrinkle in their approach in several reports). I’m nit-picking here. There’s not a lot to fault with the current PP results. The results here are still pretty good. The only blemishes are the parade to the penalty box last night, and the upticks in the shots against during the two games prior. 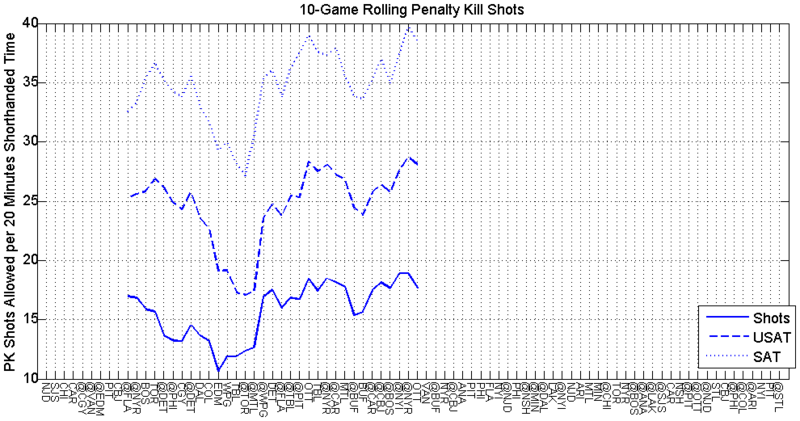 However, when you look at the scale, you see that the total is still under 1 SOG allowed per minute shorthanded time. 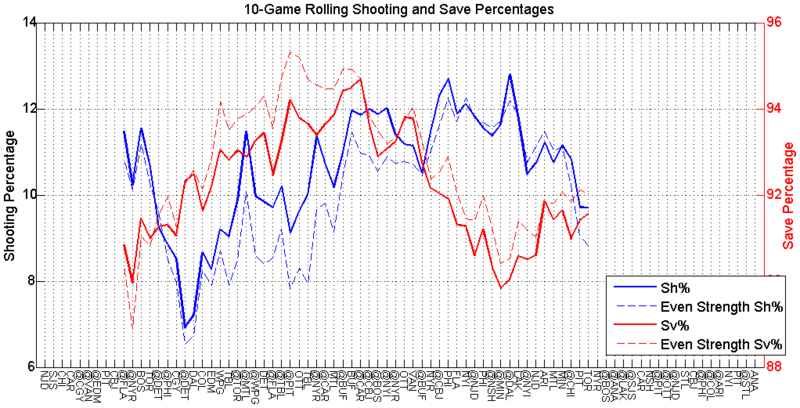 They’re staying out of the box (last night not included), limiting shots, and getting elite goaltending. 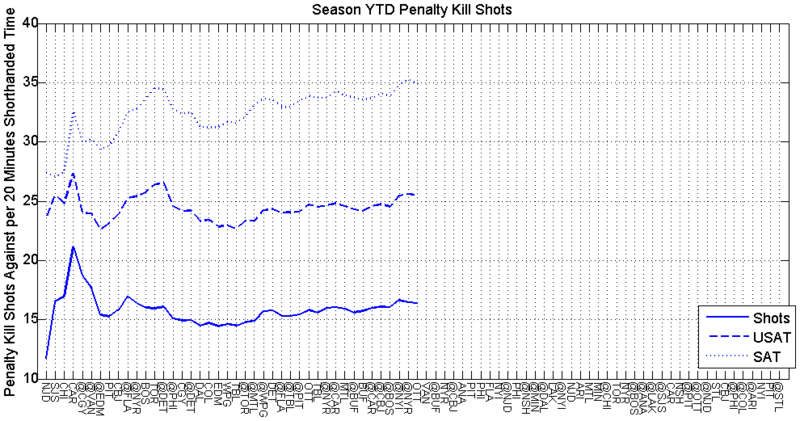 There’s reason for optimism surrounding the penalty kill, for once. 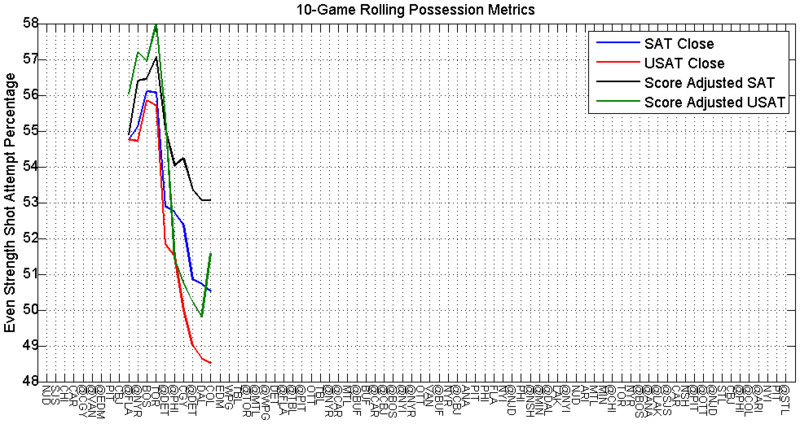 Given the troubling trends in possession, I thought it was warranted to look at what’s happening based on the score in the Caps’ games. 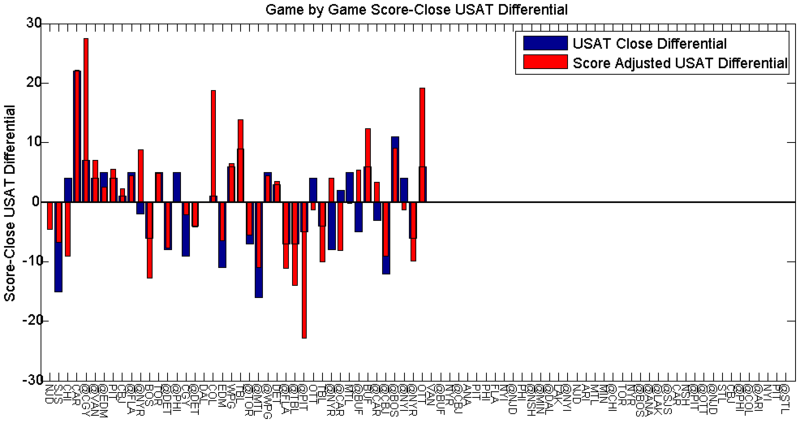 It would appear the largest contributor to the dip, is how the Caps are doing when tied. 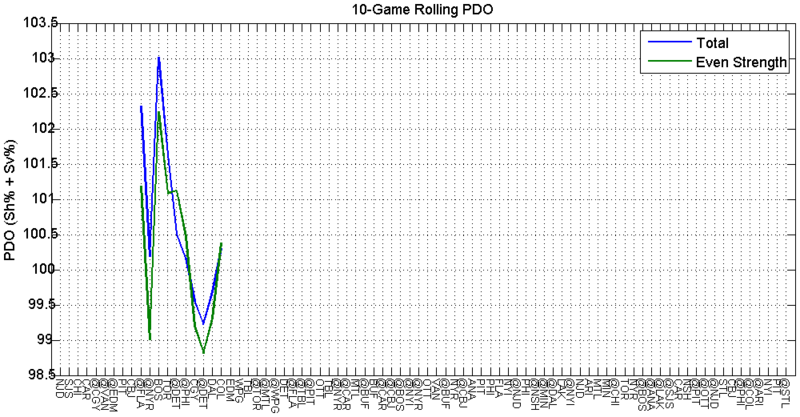 The down 2 is interesting, simply because it had essentially no data for 10 games, up until last night of course. 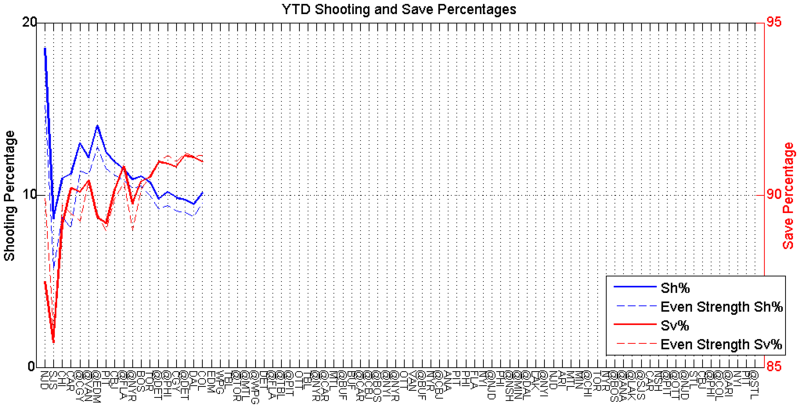 Even if the Caps aren’t controlling the puck as well as we’d all like, they’re at least not turtling with a lead, and they’re not finding themselves trailing by a large margin very often. 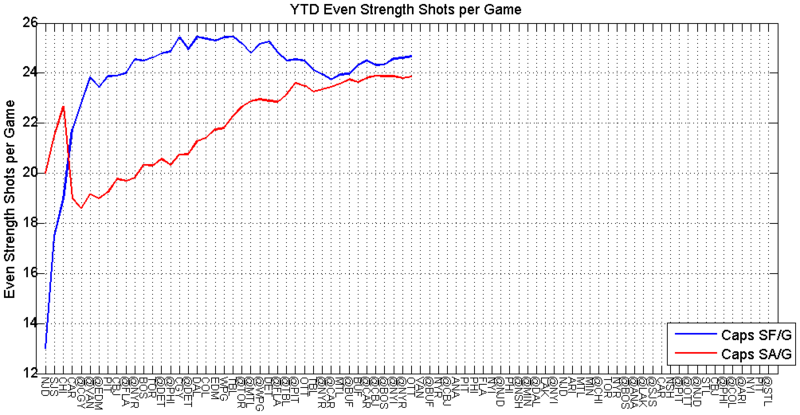 If all shot attempts (Corsi) is more your speed, the Caps are holding similar patterns. 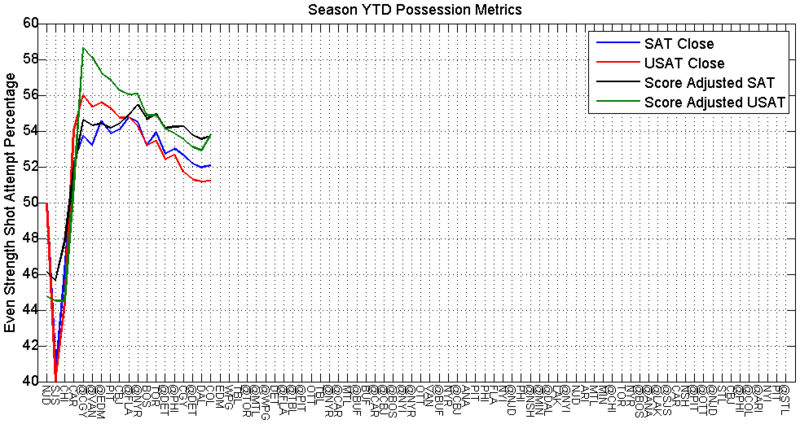 Lately, they haven’t been turtling much, and they’ve been consistently ramping it up quite a bit when trailing. 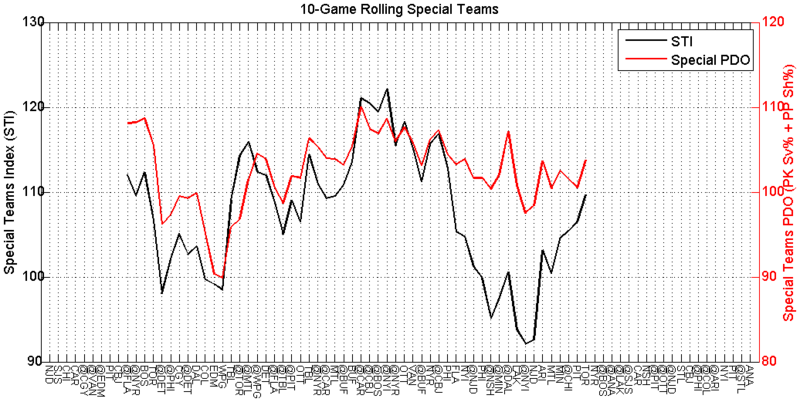 However, when tied, they aren’t the same team as we saw earlier. If it’s because they’re facing tougher teams lately, this doesn’t make the Caps sound like a cup contender a lot of experts have pegged them as. 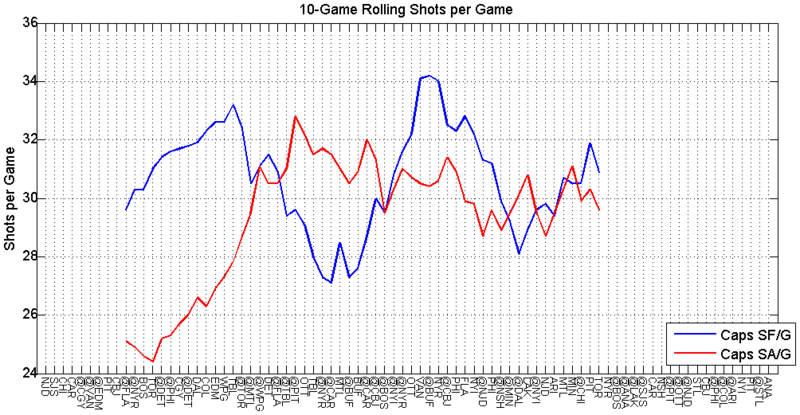 So is it the Caps are just not creating as much offense, or is it that the shots against are rising? 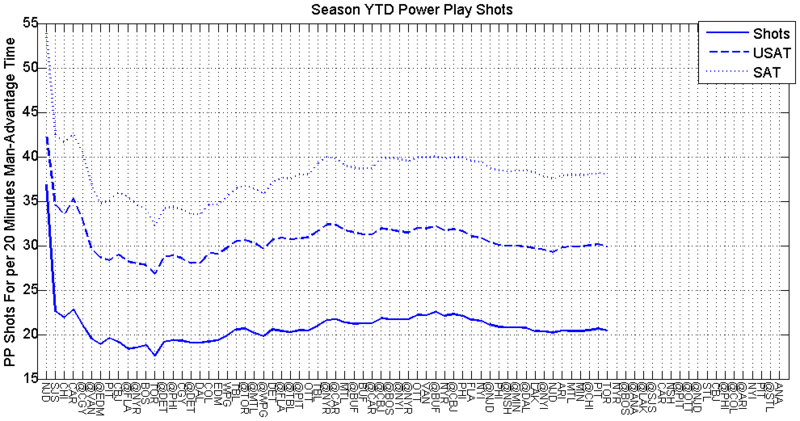 Well as was the case with the shots on goal, the unblocked shot attempts follow. 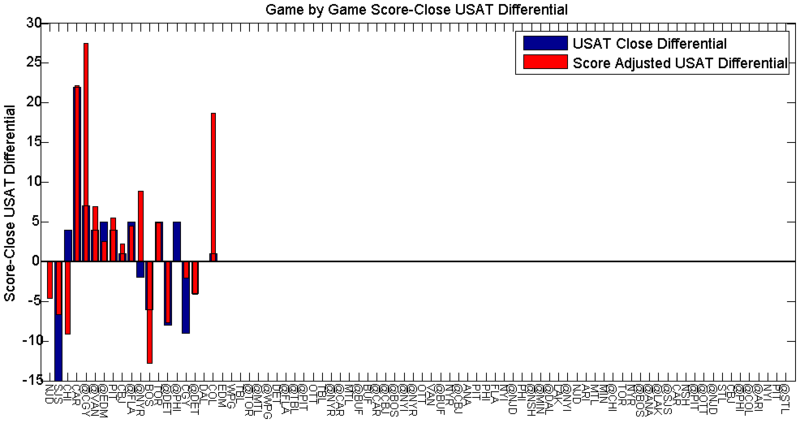 The problem when looking at the score state data, is that it’s not just when the Caps are leading that they’re content with allowing more rubber towards Holtby. When they’re tied, things are bad, real bad. 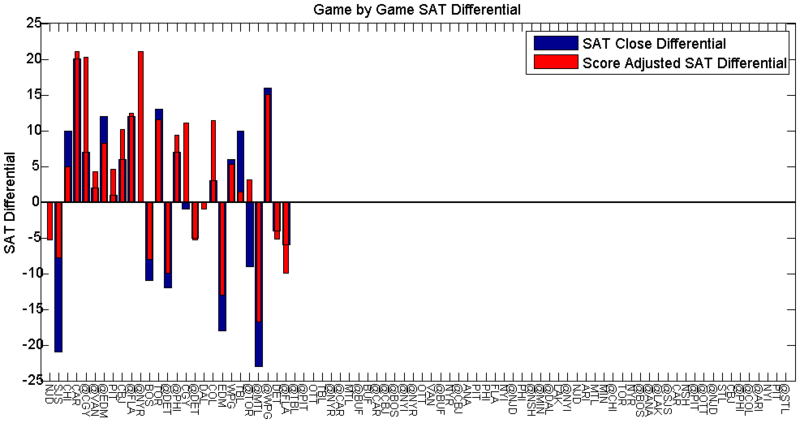 Even when trailing last night, the Caps turned in a really uninspired performance. 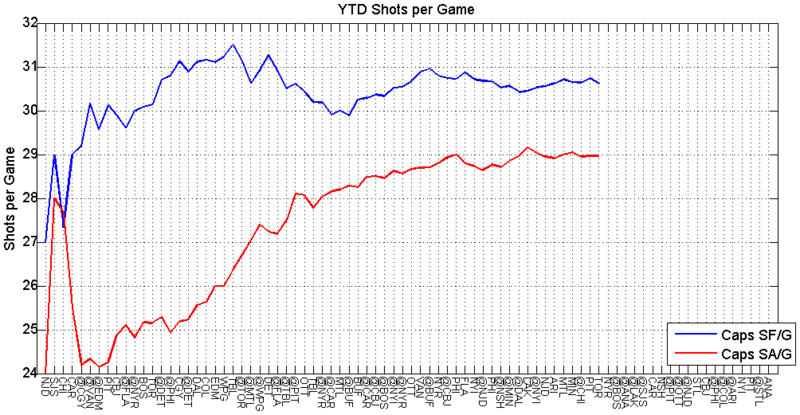 When looking at all shot attempts, there are a couple different trends to note. 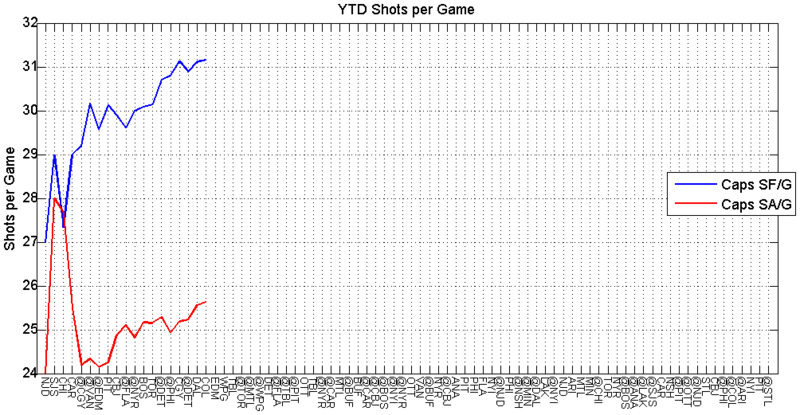 The Caps have been allowing a lot more shot attempts in the recent stretch of games, whether they’re tied, up 1, or down 1. They’re not making this sacrifice on account of more offense either. 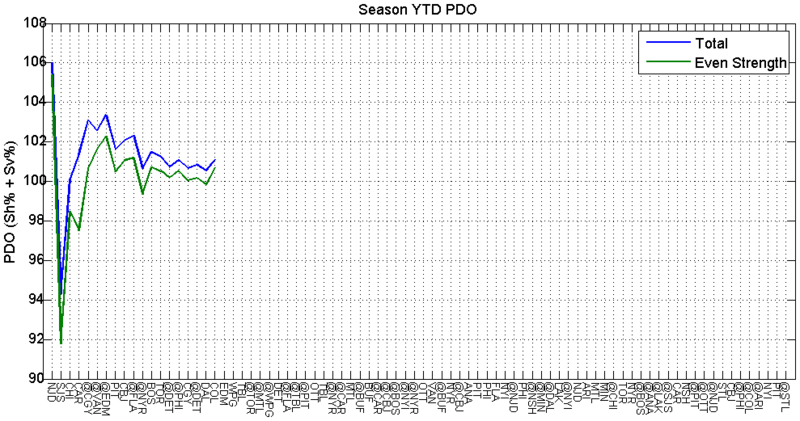 Things in the O zone have been pretty stagnant. So now that you’ve read and looked at way too many plots and pixels, do you feel better? No? Me neither. 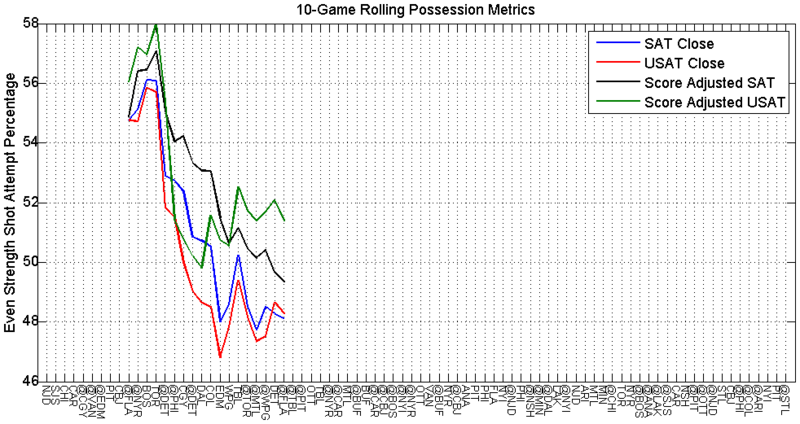 The Caps need to figure out what’s going on in their own zone. I don’t know if Orpik brought something to the locker room, and in its absence, it’s caused the rest of the defensemen to forget that peppering your goalie with pucks is generally not a good tactic. 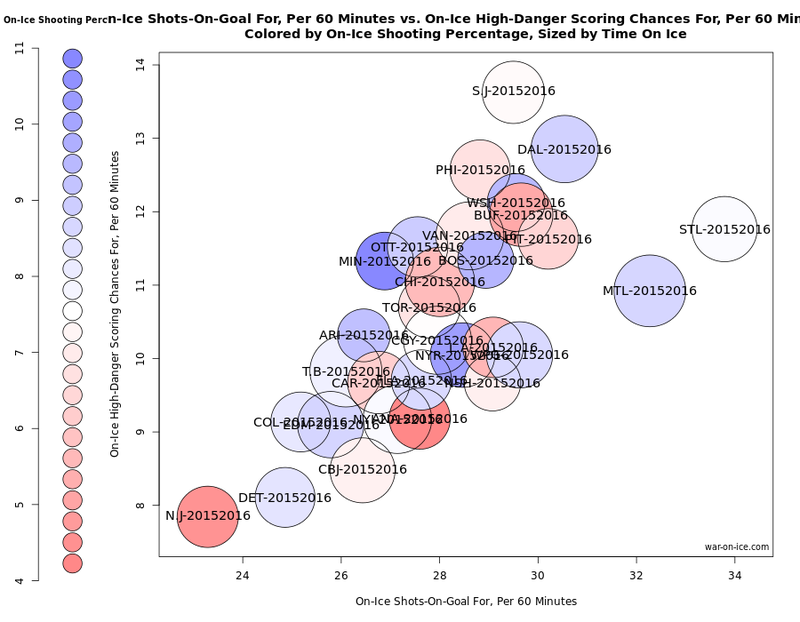 I know this trend started before Brooksie got injured, but some part of me is very curious. 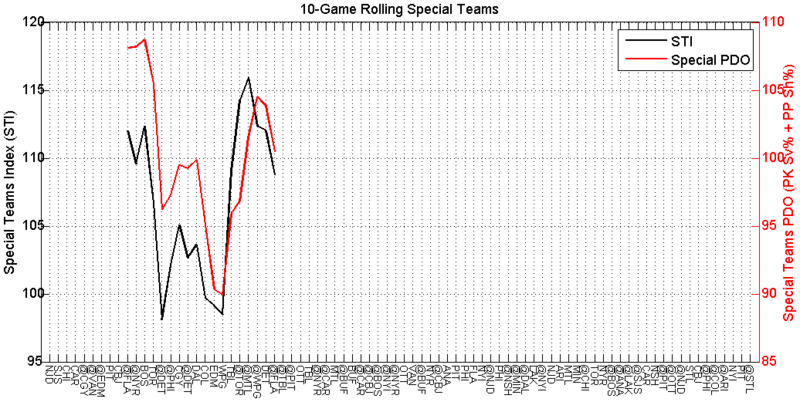 Things certainly felt more stable before he got injured. 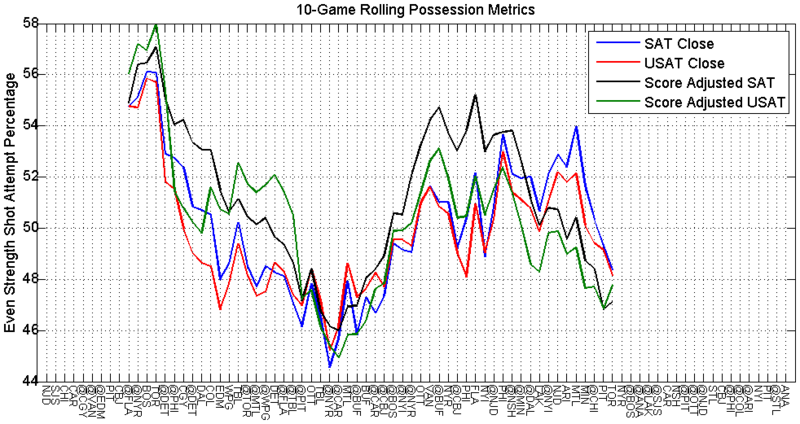 Maybe the forward lines were just less prone to turnovers, or they’ve just been failing to execute. 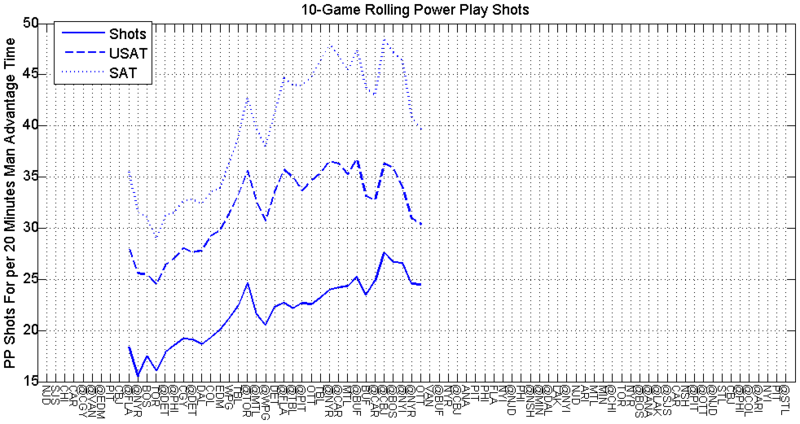 I can’t recall too many extended offensive shifts, where the Caps controlled the puck in the opposition’s end of the ice, and cycled the puck recently. I know there’s a lot to still like about this team. And maybe these past 12 or so games are just a blip on the radar, but I can’t help but be concerned when this team has cup aspirations. We’ll revisit these visuals again in a few games. Hopefully, I’ll have some better news. Sorry it’s taken me 11 games to write up a post, but I didn’t want to have just noisy, turbulent data to present without some form of a pattern forming, so we at least have an idea of who this year’s Caps are. I’m trying to move away from the legacy names for the possession proxy measurements. I’m going to start using the names denoted by NHL.com’s wonderful enhanced stat site, simply because they’re more intuitive. 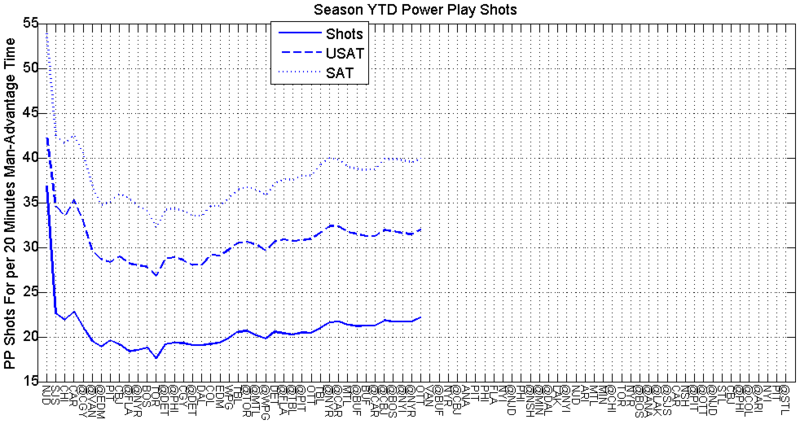 So Corsi is now SAT or shot attempts, and Fenwick is now USAT or unblocked shot attempts. These will usually be expressed as percentages of the total, as I’ve done in the past. 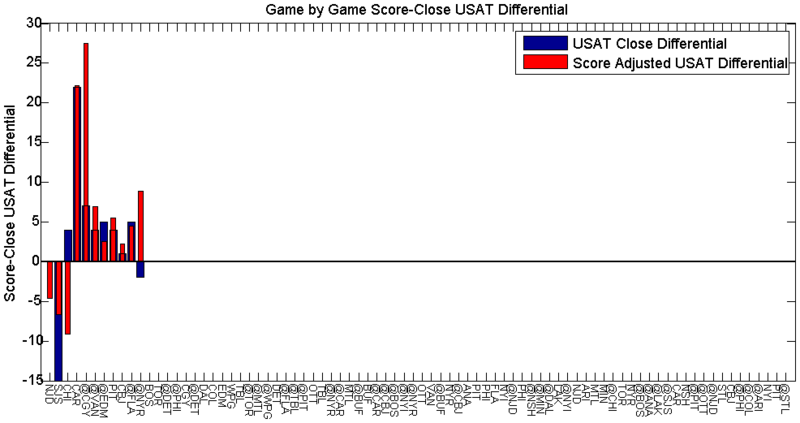 If expressed as a rate or raw number, it will be USATF for unblocked shot attempts for, or SATA for shot attempts against, instead of FF or CA. 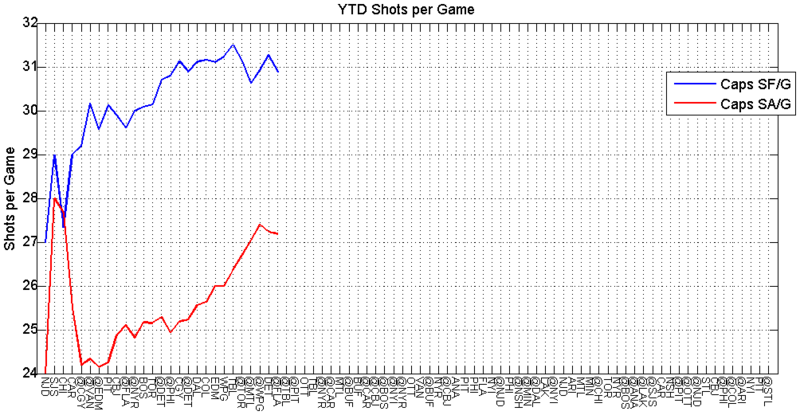 I’ve also changed the algorithm for adjusting these shot attempt metrics. 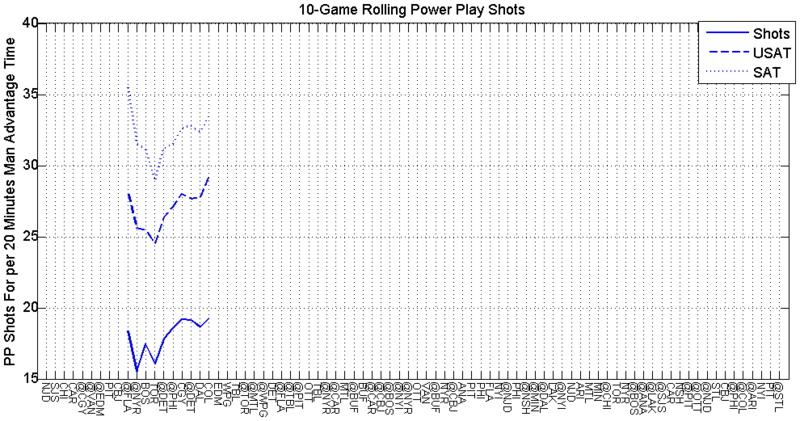 I’m using Micah Blake McCurdy’s (@IneffectiveMath) algorithm that he published. And he was generous enough to provide the coefficients he’s currently employing in all the visuals on his site. 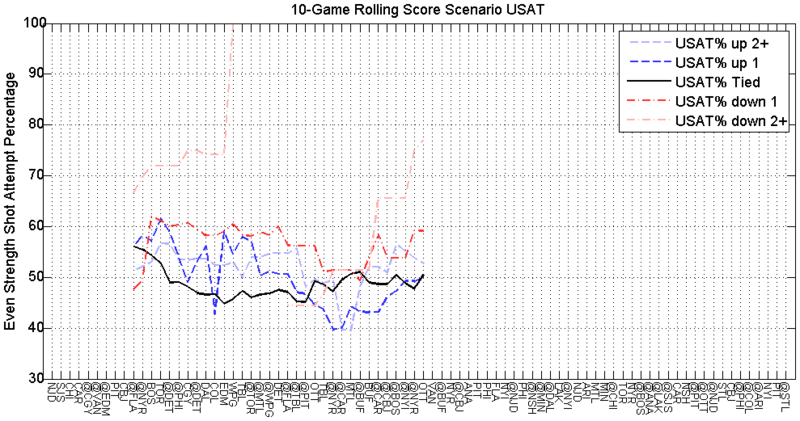 So these numbers now reflect a weighting based on score state and venue (home vs away). 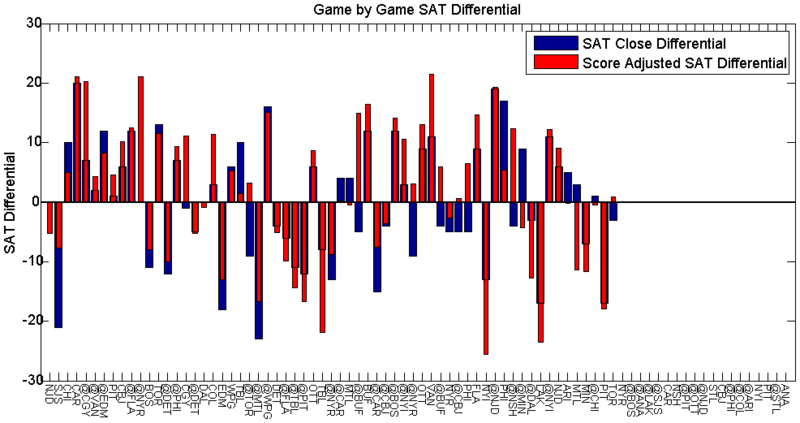 This provides a stronger correlation historically than any other commonly used methods. 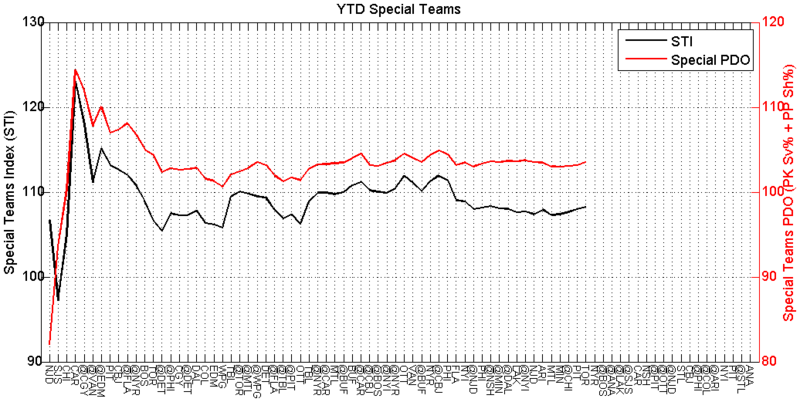 The team is quite a bit different from last year’s version. But you already knew that. 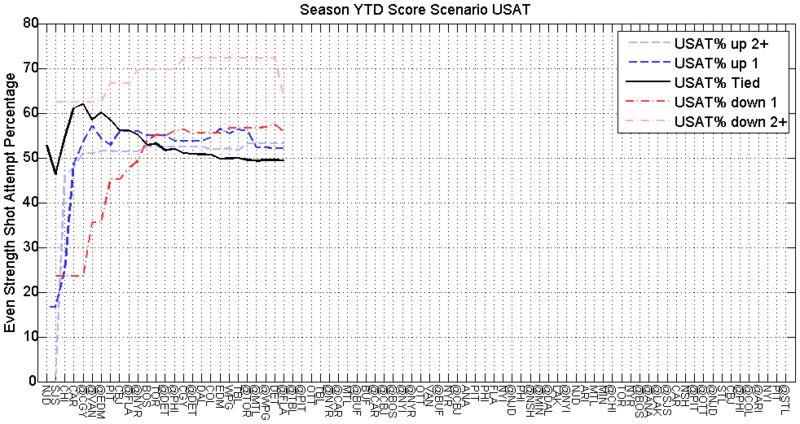 However, there doesn’t seem to be any form of an adjustment period for the system this time. 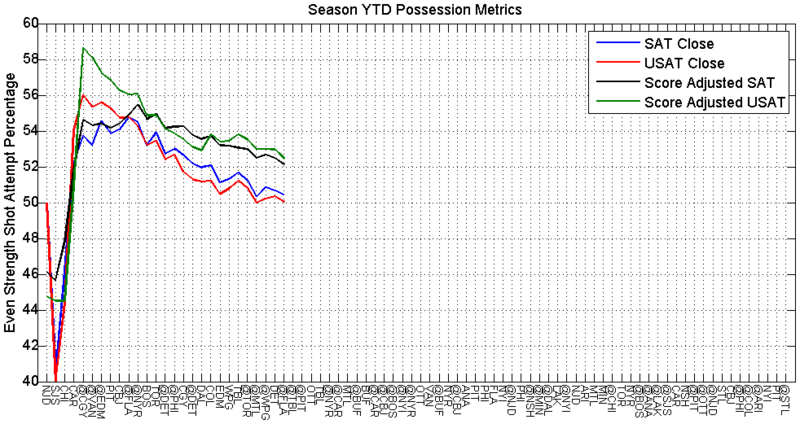 That’s actually quite impressive given the amount of turnover this team saw over the summer. There are a couple individuals whom you’d expect to have some growing pains. 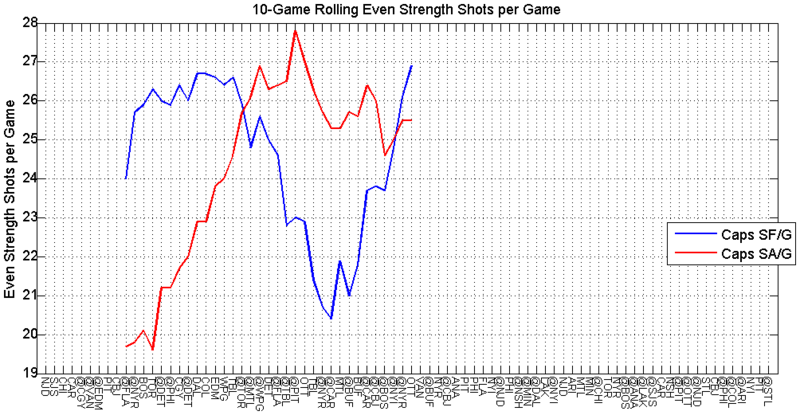 Guys like Backstrom and Orpik who had offseason surgery, and therefore didn’t have any real practice. 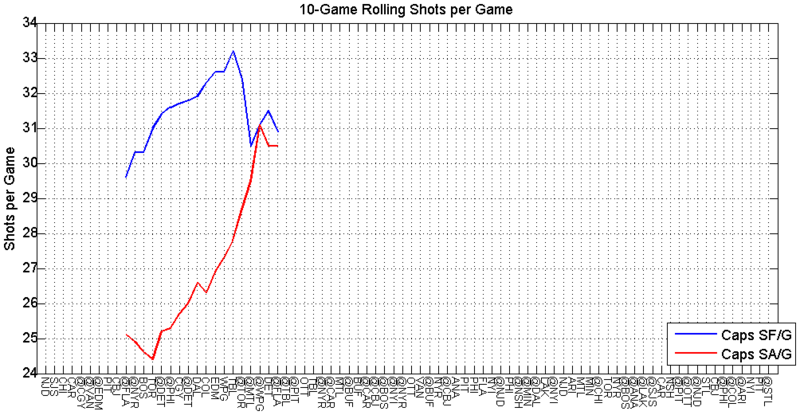 Then there’s Dmitry Orlov, who hadn’t played a professional game in like 18 months. 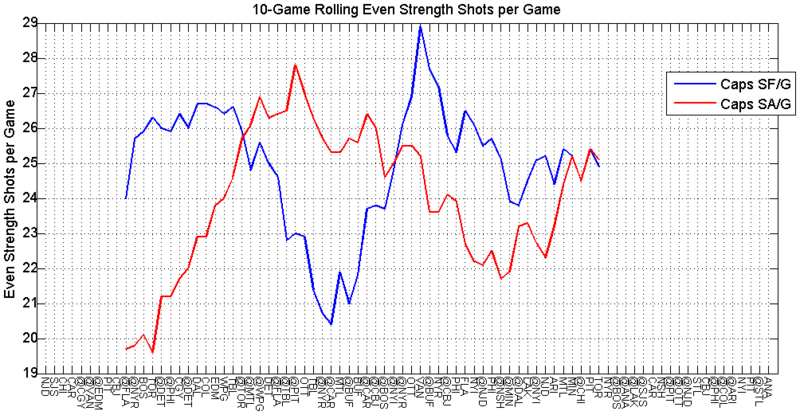 Mix those elements with the uncertainty of how newcomers Oshie and Williams would fit in, and couple that with how the younger guys would progress, or how other players would be thrust into more responsibility, and it’s not difficult to place a lot of uncertainty with how this team would perform out of the gate. So we should all take that into consideration whenever we weigh in on the shortcomings we’ve witnessed so far, whether individual or teamwide. I made that sound like there are a lot of shortcomings for this team. But there really aren’t, as we’ll see. But this is just to hopefully help balance any negative feelings we have still in our consciousness after that Rangers game. Here we go! The Caps are off to a strong start. 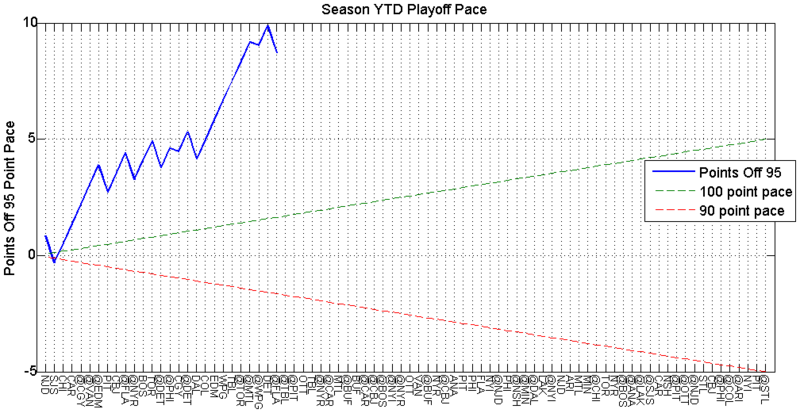 I know, you don’t make the playoffs in October, but you can miss them. 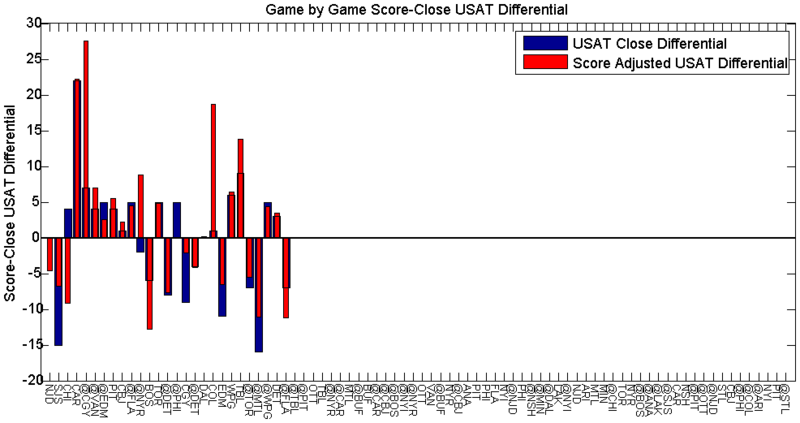 We can also say that the Caps have mostly only beaten mediocre teams, which may be mostly true. 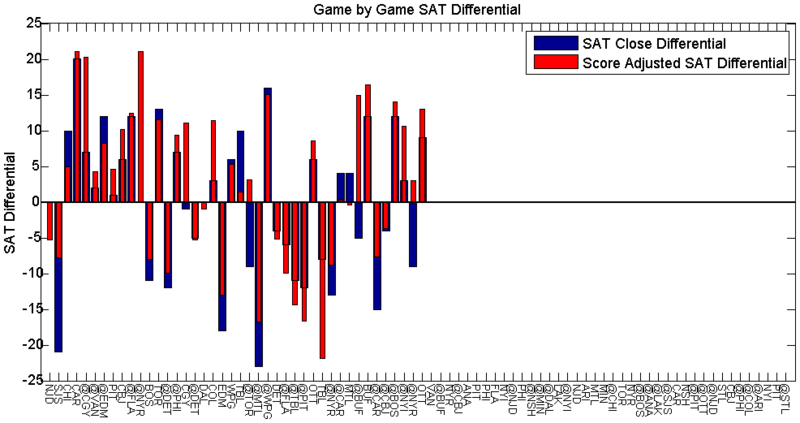 But, let’s also remember that in previous seasons, the Caps could usually be counted on to drop quite a few games to “inferior” opponents. 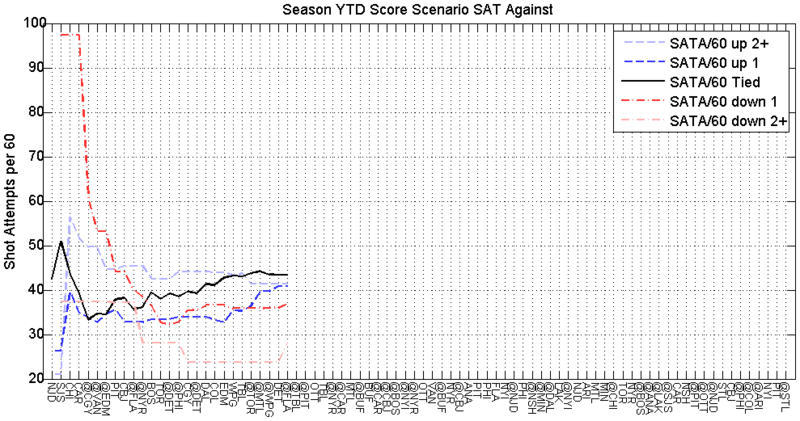 I’m going to mostly focus on the score adjusted SAT data. 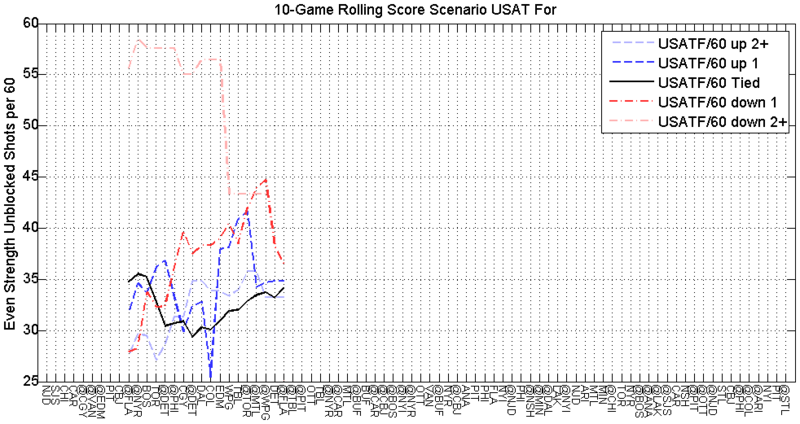 As this has become the norm in the analytics community for assessing teamwide performance now. So in that department, the Caps are looking good. They’re on the right side of 0 in all games but their first two, and they have a couple truly dominant performances. Those aren’t all wins, and wins are ultimately what matters, but this is an encouraging sign. 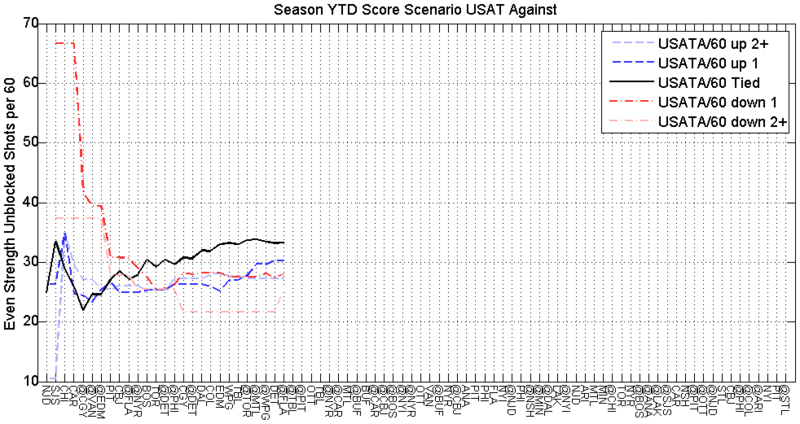 They’re above 55% for their season cumulative SASAT (score adjusted shot attempts). That’s championship caliber territory. 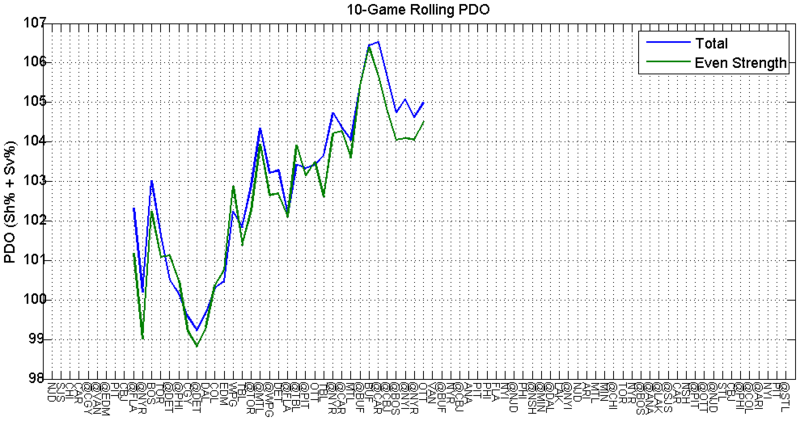 They were riding some pretty high PDO earlier, but that’s come back down. There’s a bit of mixed fortune in that though. 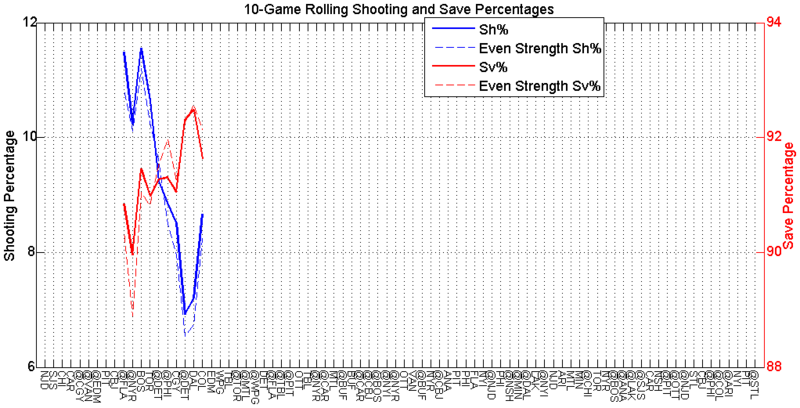 Fortunately, we should expect Holtby to increase his save percentage drastically. 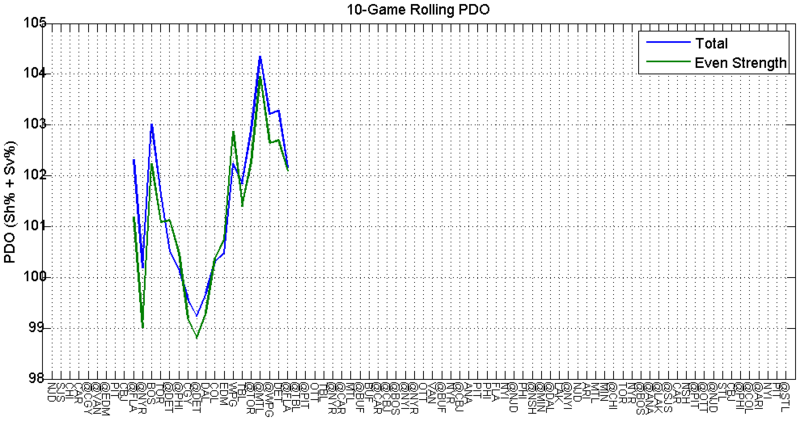 He’s well below his historical averages right now. We have no reason to expect that to continue. 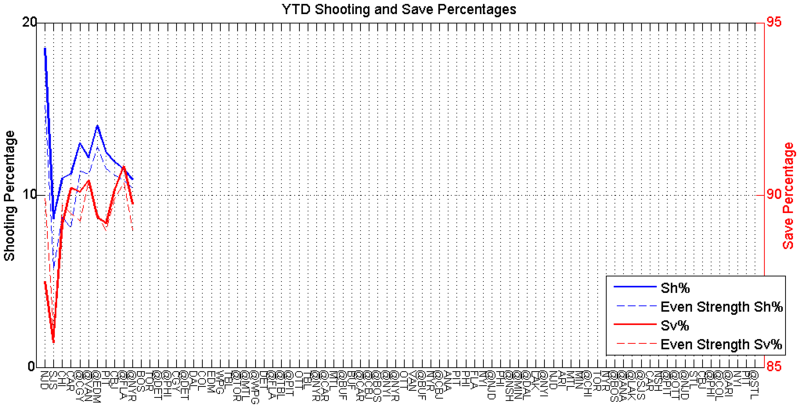 I’m not saying it’s impossible, but his .905 even strength save percentage is notably lower than his .930 cumulative even strength save percentage coming into this season. I expect to see him bounce back. And to start making some more of those impressive saves we’re used to. 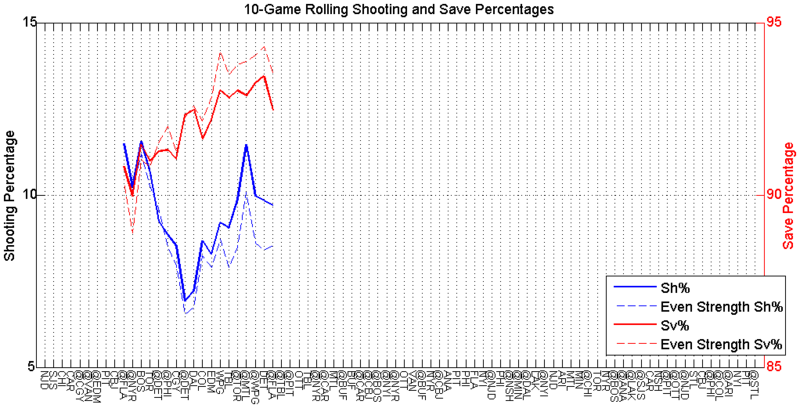 His high danger save percentage is about 10 percentage points lower than what he usually achieves. 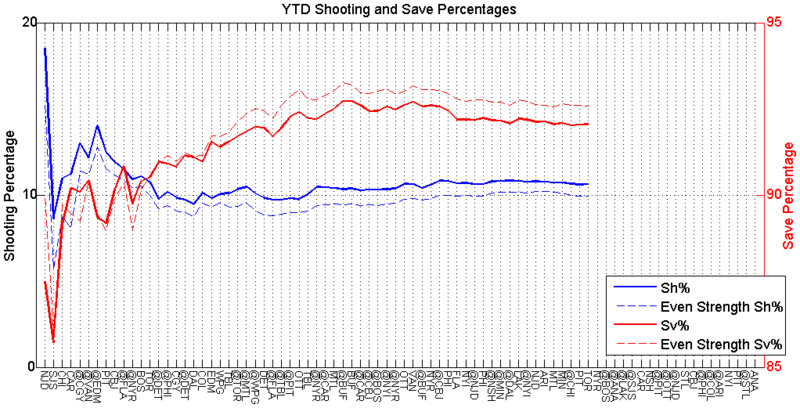 The other side of that equation is the shooting percentage though. The Caps are shooting at a pretty high level. I want to believe it’s sustainable. They have a lot of elite offensive talent. And they also seem to be a team that has a proportionately higher percentage of their events in the high danger category. 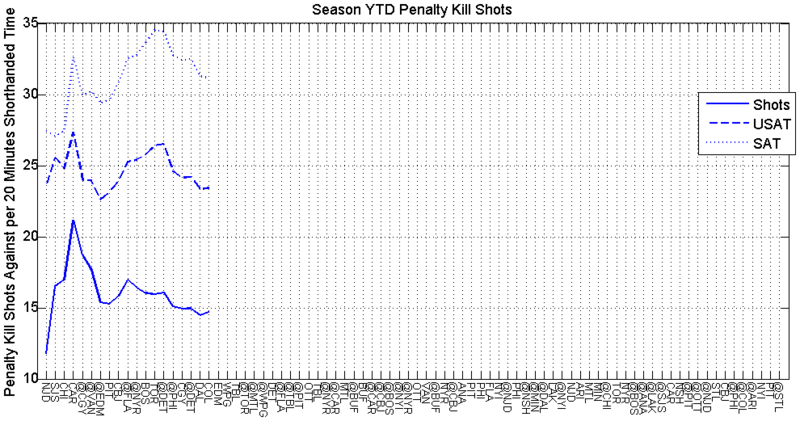 Here, we’re mostly looking at the y vs x axes. 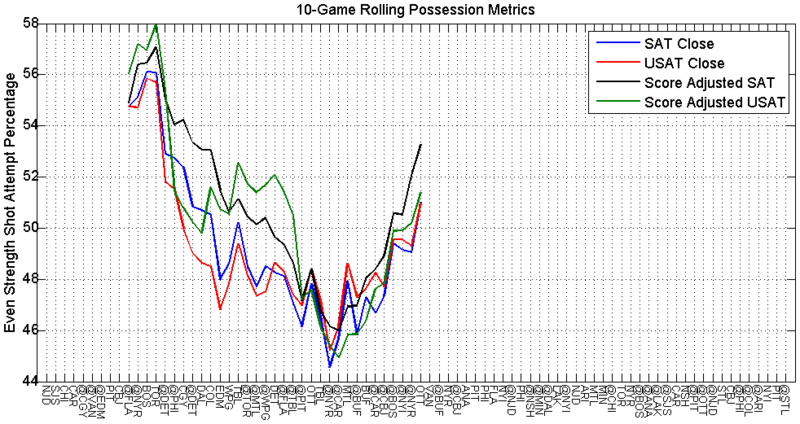 The x axis is how many shots on goal a team generates per 60 minutes. The y axis is the rate at which a team generates high danger scoring chances. The bubble color is shaded based on teamwide on-ice shooting percentage. 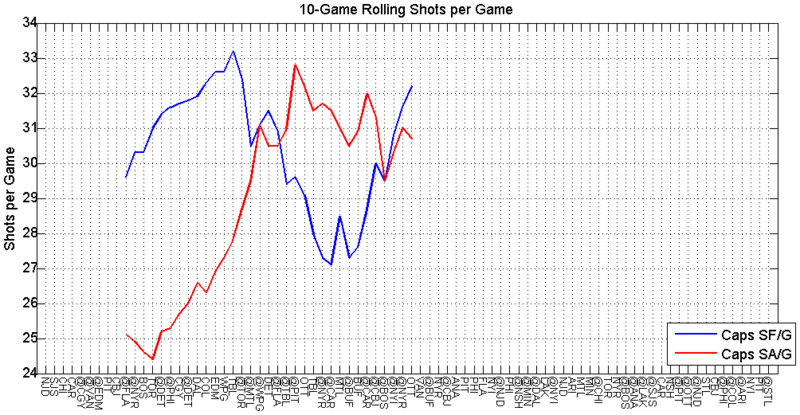 If you imagine a linear regression line to this data, you’d expect teams that lie below the line to shoot with less efficiency (and be colored red), while teams above it would shoot with greater efficiency (and be colored blue). Washington is to the right and below Philly, and to the left and below Dallas. So they should be pretty clearly above the imaginary line. 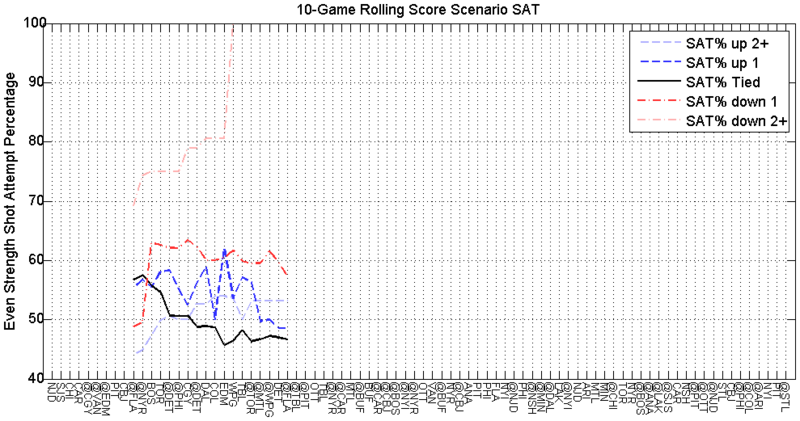 I’d expect San Jose to progress towards a blue bubble if they continue their current trends, same goes for Philly. Maybe Montreal is getting a little lucky, again. 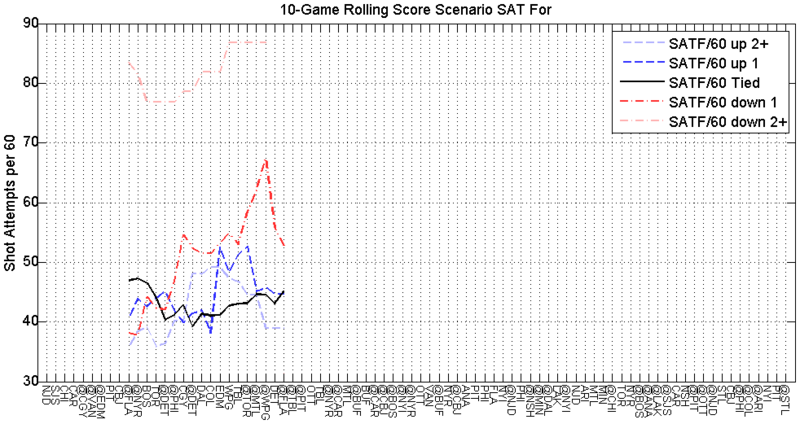 But for the Caps, I’d expect them to shoot above league average if they keep up their scoring chance generation. 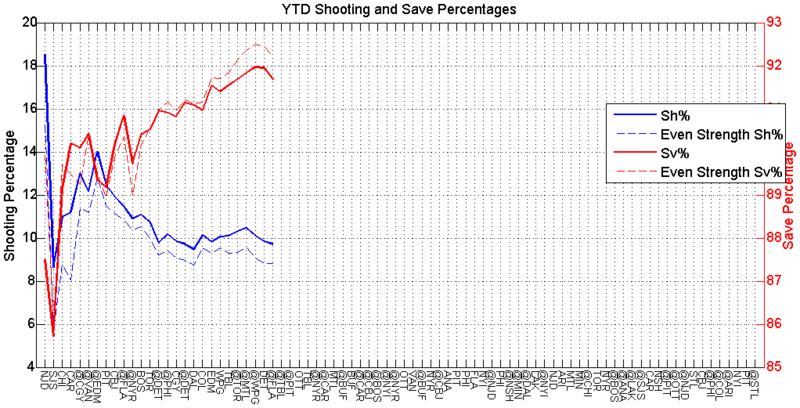 Whether, they continue to shoot so high above league average, is probably a little less likely. 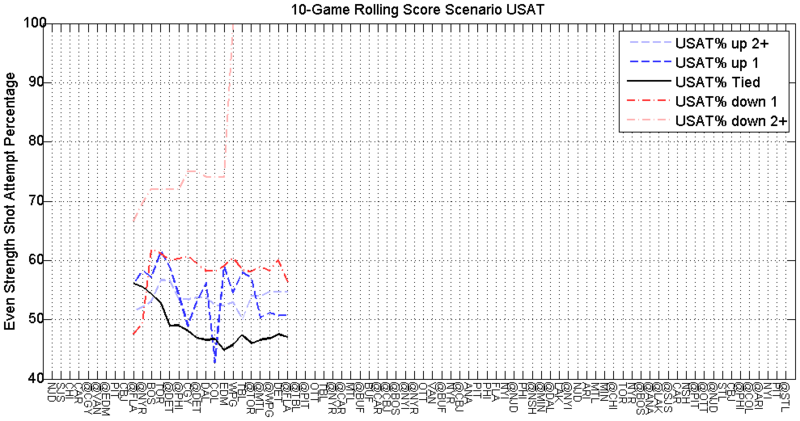 As you’d expect given their current skid, just about everything is coming down a bit for the Caps. 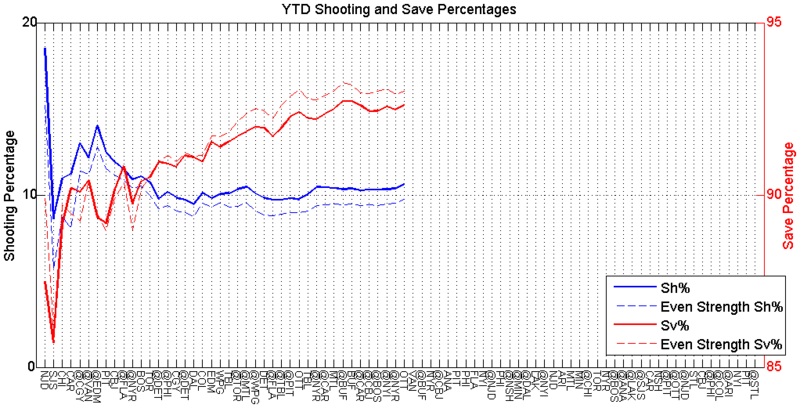 The shot generation is only decreasing slightly, so that’s encouraging. 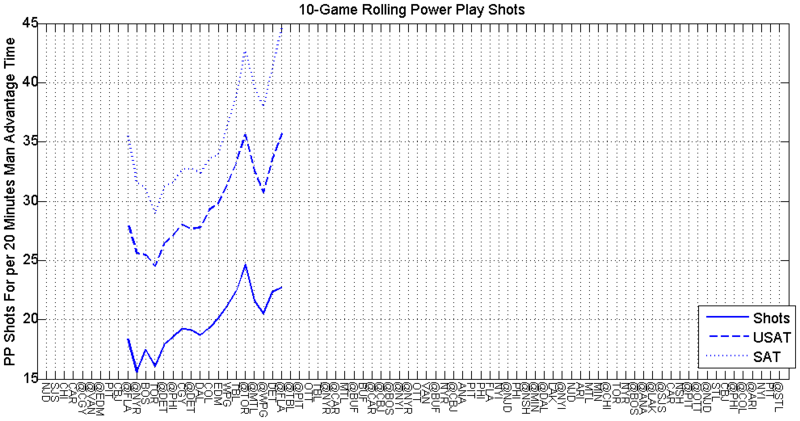 Maybe they’ve just hit a bit of an unlucky spell, because they’re still generating shots well. 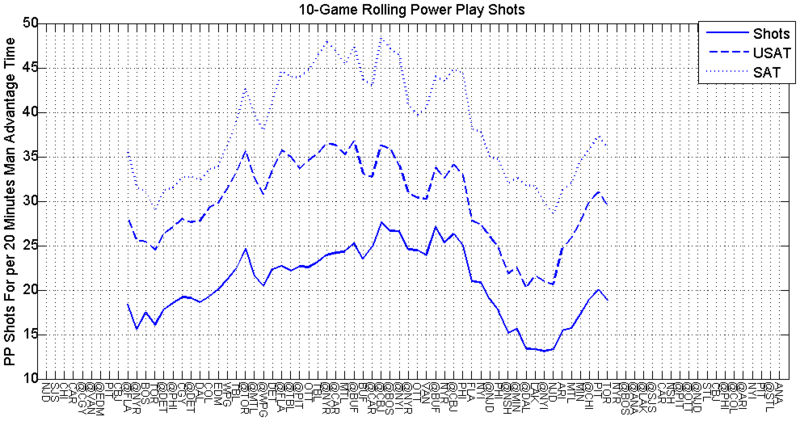 Or maybe John Western Union Carlson needs to stop telegraphing his passes to Ovi so clearly. I know there’s been plenty of teeth gnashing over the Caps’ powerplay and a lot of analysis has been done based on who’s on the point, without any real definitive answer. But I may start to look at Ovi individually, and see if his shot generation is suffering on account of RAHJC. Things are still a bit noisy here. Although, it’s comforting to see the frequency at which the Caps are heading to the penalty box is on the downswing. 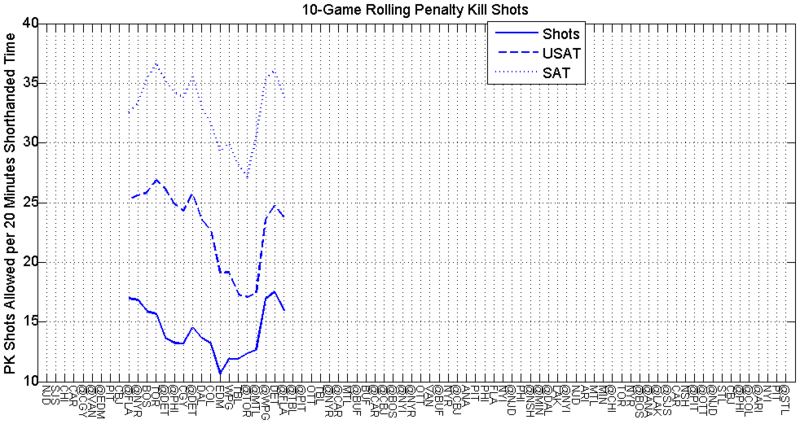 The shot suppression is a little concerning. 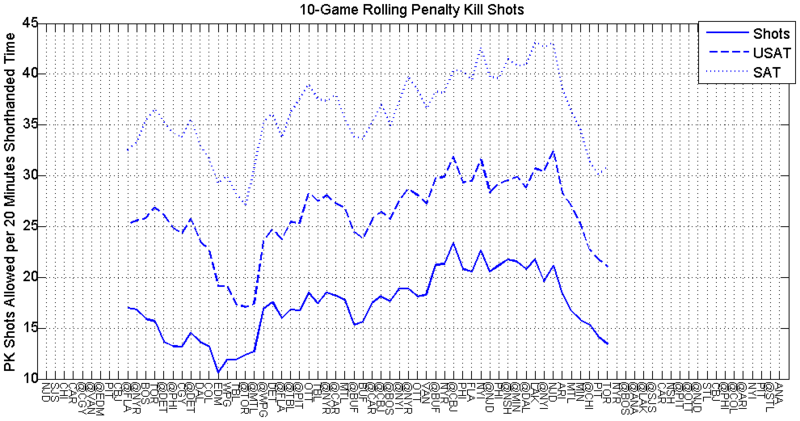 But the shots getting through to the net are still below 2/minute, which is good. That’s all I have for now. And I think that’s plenty. In future installments, I’ll look at individual score states. So we can see if the Caps have a killer instinct, or if they’re turtling, or any other fun metaphors. 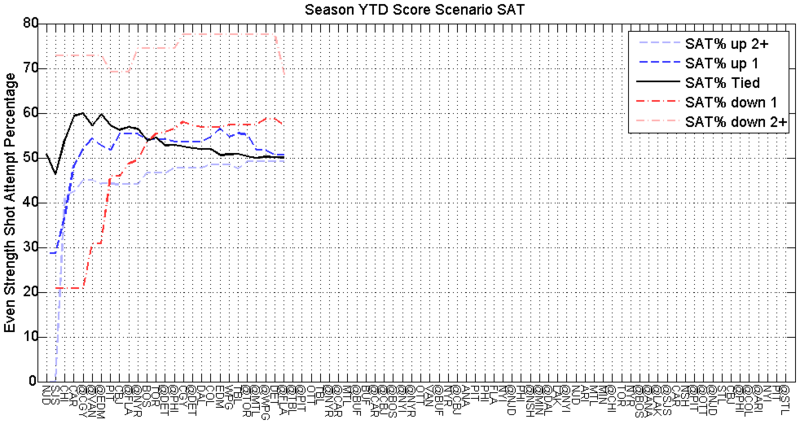 For the time being, the Caps are looking swell, and most of the data backs up the eye test. 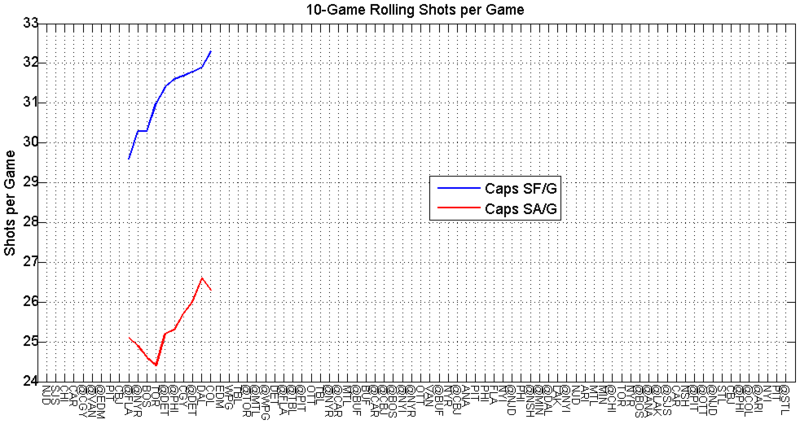 But as a word of caution: the Caps also looked really good in most departments last year too. So we’ll see if they can keep up the good work.